On the eve of July 27th, 2017, Equipment Sales & Services (ESS) handed over a Liebherr twin mechanical shovel to Debswana’s Jwaneng Mine. This is the second machine of its kind to be supplied in short succession, the previous one was delivered to Orapa less than 6 months ago. 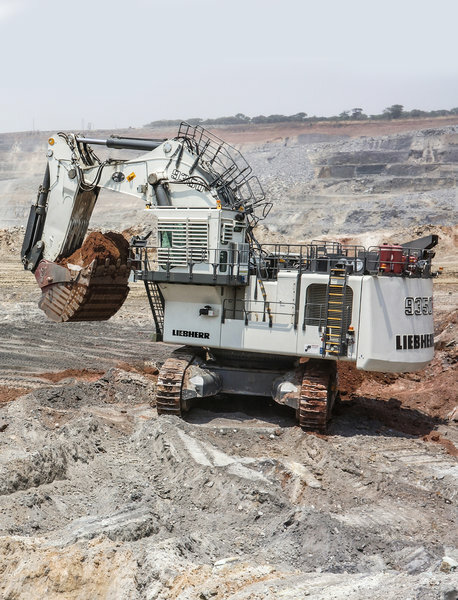 According to senior management at Jwaneng, this R9350 shovel, allows for the quickest loading of diamond ferrous ore and has proven to not only withstand the test of time but also demonstrates the most outstanding productivity, outclassing earlier models. The efficiency of this equipment has created a paradigm shift in terms of Debswana’s procurement analysis, with broader scope now being given to alternative options. Debswana’s milestone achievement in modernizing mining in Botswana through acquiring the most cutting edge technology. “It is safe to say that this equipment has a faster loading time which results in an increase in excavation, basically translating to more diamonds mined – more often”. Although ESS is a relatively small team, we are backed by our entrenched relationships with Original Equipment Manufacturers (OEM’s) and our parent company Kanu Equipment, a dominant player on the African continent. ”Kanu is a specialist in the supply of quality mining, earthmoving, agriculture, forestry, construction and road construction equipment. As the largest distributor of Bell Equipment and Liebherr, Kanu has operations in; Liberia, Sierra Leone, Ghana, Côte d’Ivoire, Congo, Cameroon, Kenya, Tanzania, Zimbabwe and Botswana. Equipment Sales & Services, with dealerships in Gaborone and Francistown, is a reputable partner to the mining industry, considered to be the local leader in its field of expertise with a very good understanding of national market needs. We are in the fortunate position of having the technical and financial muscle to supply a wide range of aftermarket spares, offering much-needed on-the-ground infrastructure to facilitate further expansion.